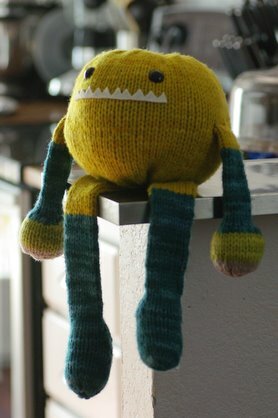 Camdyn actually picked this pattern out from the book for me to make as my second monster. I'm not sure what jumped out at her (maybe it was that he has "toy" in his name?) so even though this wasn't originally one of the patterns I planned on knitting this month, I decided to take her advice and cast on for Tony. I'm glad I did because he turned out super cuddly, and even before he was finished Camdyn was sneaking off with his body and snuggling it as she fell asleep at night. I chose to work with Malabrigo Chunky--mainly because I already had a few wound balls around. This seems to be my m.o. lately. I grab the nearest yarn cake, passing up the gorgeous skeins of yarn right next to them because I am too lazy to get out my swift and ball winder. I also didn't weigh these cakes before casting on, so I can't tell you exactly how much yarn I used. I really need to break this lazy knitter habit! 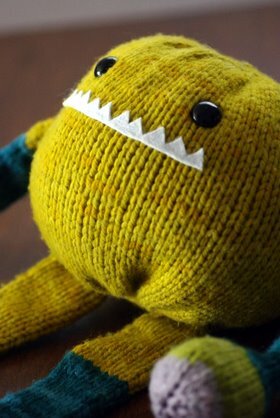 I knit Tony's body first from my biggest cake of Frank Ochre. When I finished, I realized I wouldn't be able to complete any of his other parts from the same color. Though I have always been a huge fan of DPNs, I decided to give the Magic Loop technique a try so I could better match Tony's limbs by knitting them two at a time. Last month I ordered the complete set of the Knit Picks Interchangeable Needles, so I decided to put them to good use and knit Tony's legs first. This is my first time using this technique, but I can't believe it took me so long to try it. Knitting the legs in a pair was great! I loved how when they were done, that was it!